« How to Do the Keto Diet On a Budget -12 Tips to Save You Money! I love any egg roll in a bowl recipe and it sure is a great recipe to adapt to Keto/low carb. 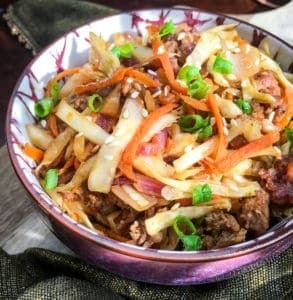 Egg Roll in a Bowl is fast and easy and is basically one of the many crack slaw recipes out there. It’s a perfect weeknight recipe because it’s so fast and easy. You can can cut up all the veggies yourself or you can do what I do and use a bag of coleslaw mix instead. Super fast! Many people use ground beef for this but I really like using a mix of ground chicken and pork. The only other tip that I want to be sure to point out is one key ingredient. 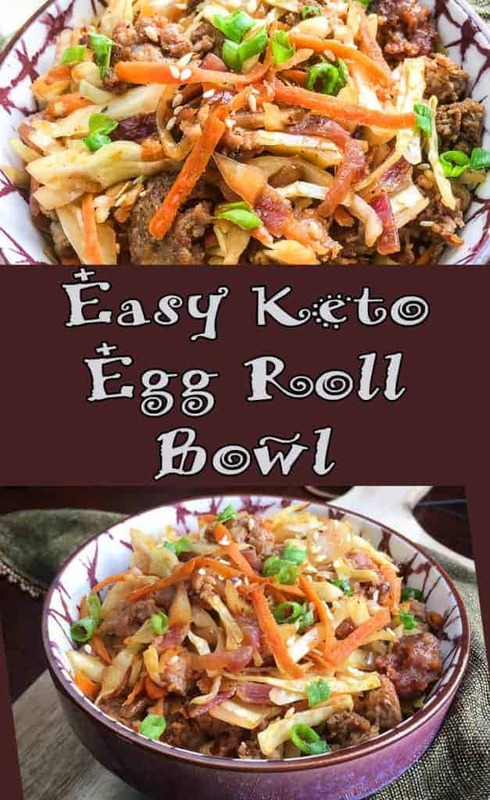 Natural Rice Vinegar with zero carbs and sugar is Key to an authentic Keto Egg Roll in a Bowl taste! Rice vinegar is important to the taste of the sauce but they are generally loaded with sugar so be careful! You want to find an all natural rice vinegar that has zero carbs and zero sugar for this recipe. 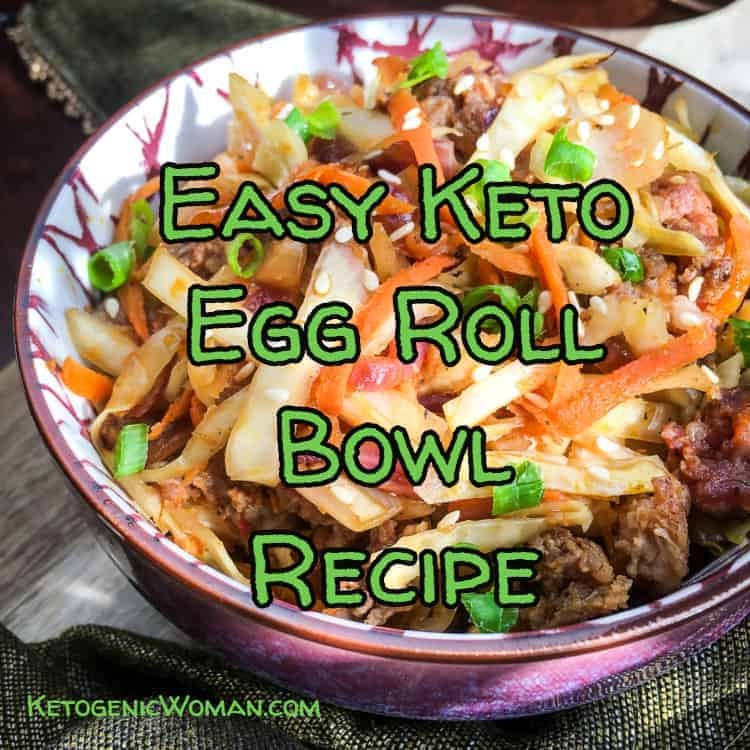 NOTE: To make this Keto Egg Roll in a Bowl even easier, you can use 4 cups of Coleslaw mix instead of the other veggies. I often use whatever I have on hand but I do like it best with some bean sprouts. Heat a large high-sided skillet over medium-high heat. Add the chicken or sausage meat and cook, crumbling the meat while it cooks for about 5 minutes. While the meat is cooking add the sauce ingredients to a small bowl and stir with a fork. Once the meat is cooked, remove from heat and drain some of the excess fat but leave about ¼ cup or so in the pan. This is not an exact science, you want to leave just enough in the pan to cook the rest of the dish without burning. Return skillet to heat and scrape up brown bits from the bottom of the pan with a wooden spatula. Reduce heat to medium and add the coleslaw mix, asian vegetables and bean sprouts. Season with salt and black pepper, to taste, and cook, stirring frequently, until the vegetables wilt, approximately 4-5 minutes. Add the sauce mix and stir to combine for 1 minute or until heated through. Remove from heat and transfer to a serving platter or bowl. Garnish with chopped green onions and a sprinkle of sesame seeds. Tagged Budget Keto, chicken, keto dinner recipe. Bookmark the permalink.